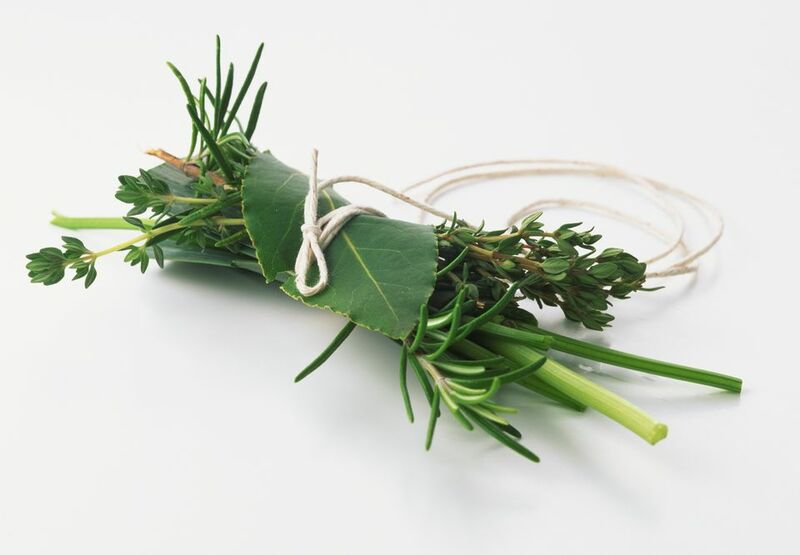 A Bouquet Garni (pronounced "bo-KAY gar-NEE") is bundle of herbs and aromatics (such as celery or leeks) tied together with cooking twine and simmered in stock, soups or sauces to add flavor and aroma. The tied bundle is then suspended in the simmering liquid by a length of cooking twine so that it can be easily retrieved and removed at the end of cooking. Depending on what sorts of herbs and aromatics are being used, the bouquet garni components can be bundled together in different ways. For example, the herbs can be bundled into a section of leek or celery and then tied securely. Even a fresh bay leaf can help to hold the items together. A bouquet garni is similar to a Sachet d'Épices, but a sachet differs because it's a pouch of herbs and spices tied inside a piece of cheesecloth. How Can You Use Nutmeg? What is Turmeric Used for in Cooking?